To celebrate this gorgeous Sunday here in Virginia and the end of this year's Occasions Mini Catalog, I'm sending out a very special offer to all of my customers. If you place an order on my website of $50 (or more), you will be entered in an AWESOME drawing. All names will be put into a hat and the winner will be drawn on Wednesday, May 2nd. Wanna know what you'll win??? 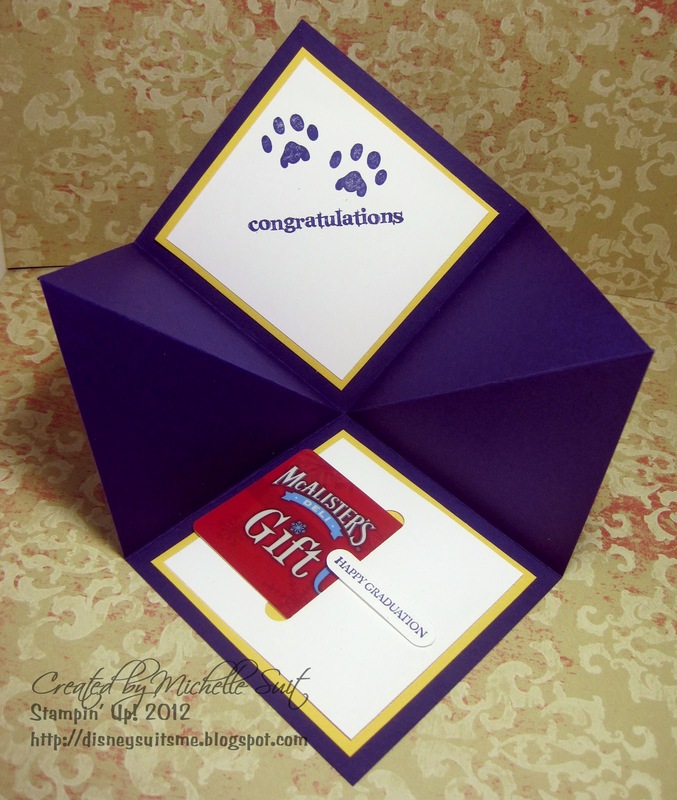 The winner will get to choose the BIG SHOT DIE OF THEIR CHOICE (up to a value of $32.95). How awesome is that??? 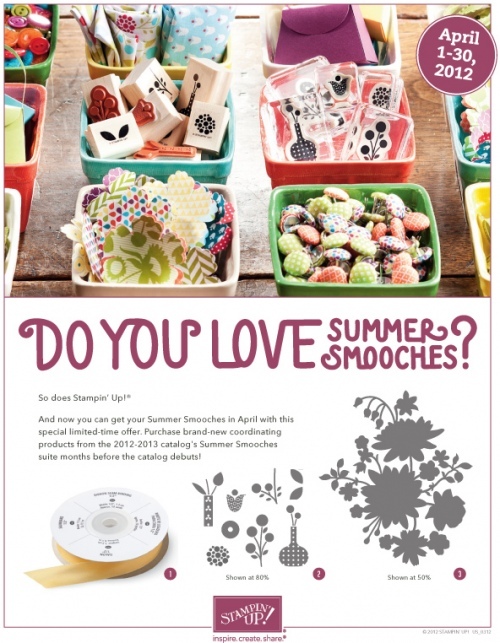 There's the Clearance Rack, The Occasions Mini Catalog, The Summer Smooches Suite and all of the Retiring Stamps and Accessories. So don't miss it. Check it out before the deadline and start thinking about which die you'll choose for FREE. It's that time of year! Graduations galore! If you're looking for the perfect way to make the grads in your life feel special, I have just the project for you. Come to my "Pomp & Circumstance" Stamp Camp and make three 3D gifts and two lovely graduation cards. 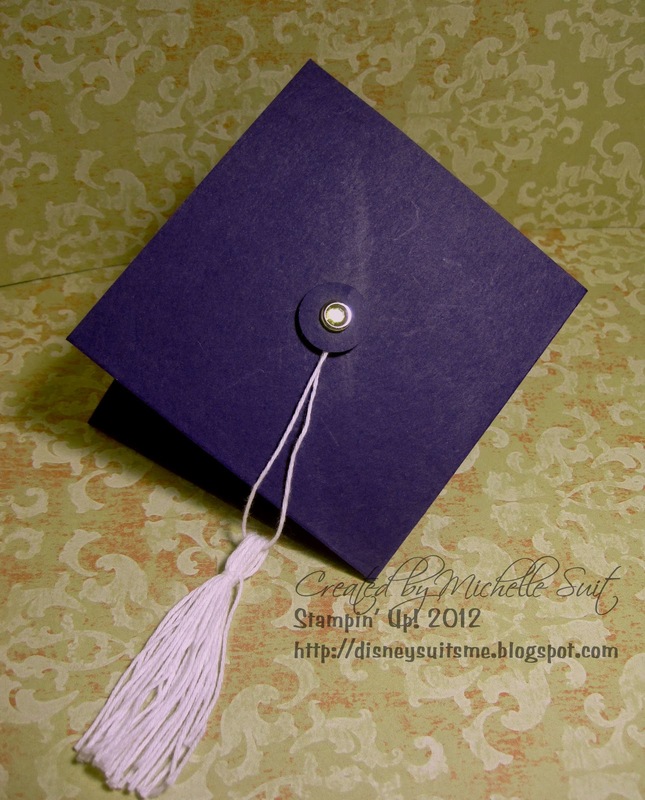 When you RSVP just leave the school colors you'd like to use to celebrate your grad. I'll customize your kits just for you. The purple and gold and the paw prints are for my favorite JMU Dukes. 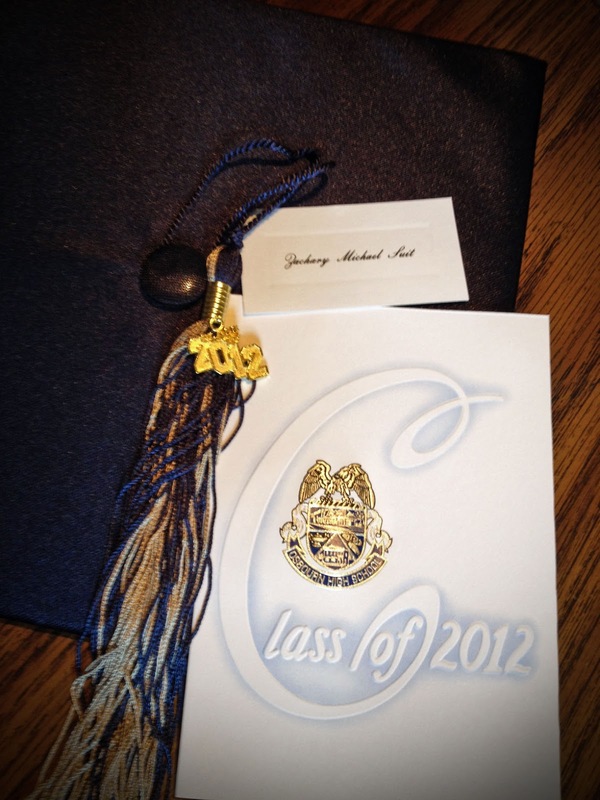 I just happen to have a very special someone graduating from there in 2 short weeks! 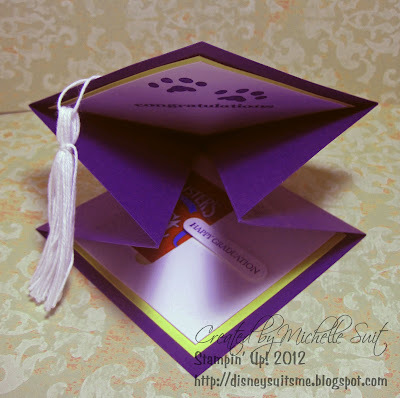 It's Graduation season and we're going to be making three 3D items and two grad cards. Please note the school colors you'd like to use when making your projects. The cost is $20 and all supplies are included. Please RSVP no late than Monday, April 30th. I knew it was coming. It's not like it was a surprise. Seriously? Why am I feeling this way? We got a postcard in the mail letting us know our "remaining balance" on Zach's graduation collection order.....cap, gown, announcements, tassle... Delivery date....Monday, April 23rd, 2012. Ok. Fine. When we got home this afternoon he pulled the big box out of his backpack and left it on the table for me. That's what he does. Need a lunch check? 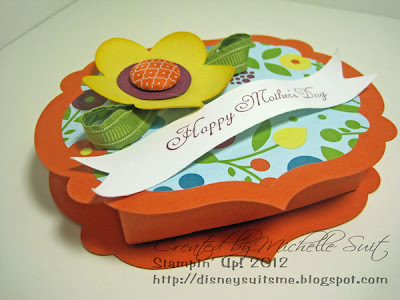 Leave agenda out for Mom. Need a form signed? Leave it on the table for Mom. Today, though, it was different. That box contained more than just card stock with the school seal, a silky blue graduation cap and gown and a tassle with a shiny, gold "2012" dangling from it. That box packed quite a punch. In fact, it knocked the breath from my lungs. Still....why? Why? Three simple letters. Three letters that seem like such a simple word. Three letters that haunt me everyday. Now I know that I've had SO many people say, "Oh, Michelle, you just can't ask yourself "why". It will drive you crazy". (short drive...hahaha) Not to be disrespectful to those who've said it....but I kinda think at this point I've earned the right to ask "WHY?". Haven't I? No seriously. I remember vividly the day I was laying on the table at my OB/GYN's office. It was one of the very few appointments that Mike couldn't be there for. He was on travel and he was extremely bummed to miss it. . Today was a different visit though. After two girls I was waiting to find out if we'd be buying even more pink or.....maybe we'd be buying blue. I'd been dreaming of what it would be like to hear that I was carrying the little boy who would grow up to be the apple of his daddy's eye. There would be sports (like Mike never played...LOL), "boy" adventures, scouts, car stuff, and maybe...just maybe we'd have a VT Hokie just like his dad. He'd probably be a geek...a nerd....analytical...funny...smart....and SO handsome. We'd laughed at how different it would be having a boy after two frilly, little girls. I lay there holding my breath as they did the ultrasound and I remember the doctor saying, "Wow! You see that? It's like this little one is sitting on a glass top table and we're looking up from underneath. Yep. No mistaking THAT! It's a BOY!" Today I realized something. I did get the BEST gift. I got a boy who has grown up to be funny and smart, analytical and somewhat of a geek and he is definitely incredibly handsome (all 6' 6" of him). We are indeed blessed beyond measure. There's still a whole in my heart though at the "what if's" though. Now you can throw stones at me and tell me I have no right to feel that way. That's ok. But I believe MY God.....the one who knew me (and you) before I was ever even conceived....who knows every single hair on my head (yep...the gray ones too)...He's strong enough to take whatever I can dish out. He holds me in the palm of His hand and lets me be sad and mad and let's me ask "Why?". It's ok. He loves me anyway. I know this more than any other truth there may be. Do you know how much He loves me? He loves me SO much that He entrusted me with three very precious gifts. He loves me SO much that he entrusted me with two very real treasures who just happen to have autism. Autism. Ugh. I'd never heard of it back on that day I lay on the table in that doctor's office. Little did I know that God had other plans. A different plan. A scary plan. A better plan? Yes. Today when I looked at the enclosure cards that will go in each of my son's graduation announcements, I ran my finger across the raised silver lettering...."Zachary Michael Suit".... Wow. How different I look at that now. How proud I am to be his mother. How blessed am I? Mike got home from work and he saw the things on the table when he came in and walked over to see them. We stood there together and he looked at each item. He held up the announcement to read it and he smiled. I saw him look at the name card. I saw him run his finger over the lettering and I whispered, "I'm sorry". He grabbed me and hugged me so tight and told me the words he's said before and I'm sure he'll tell me again. "Don't say you're sorry". With tears running down his cheeks he smiled and said, "We are SO blessed. God gave us the perfect kids. We've been blessed over and over and over by them. Do I wish things were different? Sometimes I do. Not for us....mostly for them. I want to give them the world. They deserve it. We are so blessed and I love you and them beyond words". I couldn't walk this walk without him. So many of the special ed parents we've met through the years are now divorced. The pressure was just too much. Fortunately we've weathered many storms and come out stronger. I'm sure there'll be more. We can do this. With God's help and by standing together....We can do this. I am sad today because Zach isn't going to head off to college in the fall.....he won't be going to Virginia Tech like his Dad.....he won't be finding the love of HIS life there and building his own family. That does hurt my heart. I hurt but you know what....he doesn't. He's SO happy. He's SO proud of his class ring...his cap and gown....the tassle....all of it. What joy there is in his heart. He WILL continue to grow (hopefully not UP! )....He'll continue to bless those who meet him....He'll continue to be our "little" boy and we feel God's love and His arms around us all. Thank you, Lord, for blessing me with such a gift. Thank you for loving me loving me when I ask "why". I praise you and thank you for it all. It's been a rainy, rainy Sunday and we've gotten SO much done. I actually feel like it was quite a productive weekend. Whew! I just came down to my Stampin' Space to work on some new designs that are rattling around in my head. I want to share a cute, little wedding gift card holder I made for a friend of mine with you. This is such an easy way to include a gift card. I simply used a piece of card stock and scored it to fit the gift card dimensions. 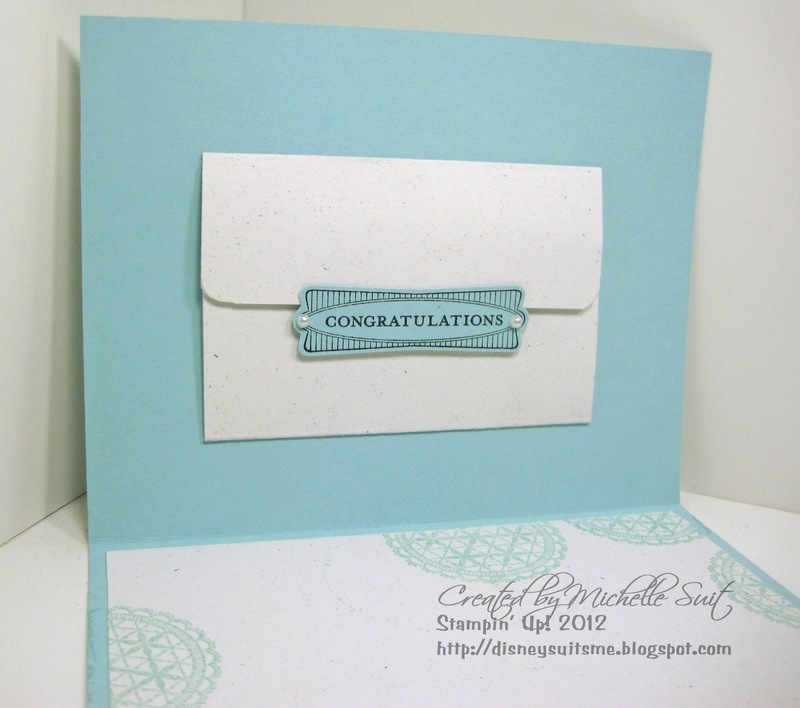 I then popped up the "Congratulations" sentiment stamp with Stampin' Dimensionals and have it placed so that the flap of the "envelope" is held in place. Fun, huh? I stamped the inside of the card and the matching envelope using the coordinating "Delicate Doilies" stamp set and Pool Party ink. It's so soft and just really lovely. Wishing you a wonderfully magical day! 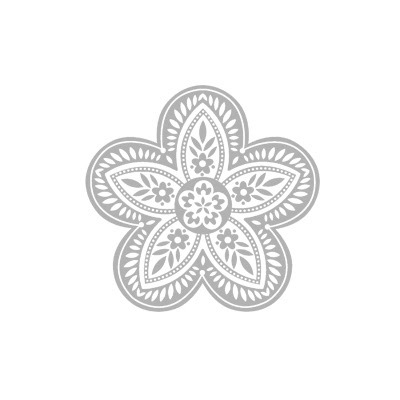 I've been having SO much fun down in my stampin' studio tonight. I've pulled my retired stamp sets and getting things organized. I've got something really FUN planned for next month so be sure to stay tuned. No tedious, time consuming cutting required. 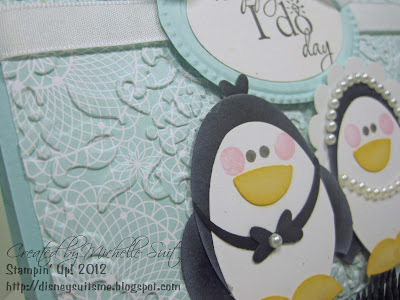 Just stamp...punch and VOILA! I love it! 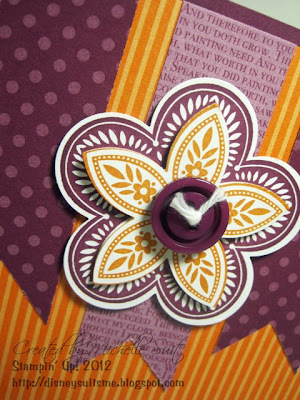 One other product that I'm currently quite smitten with is the Designer Series Paper Pattern Stacks. I will admit it....I'd never tried them until recently. Let me just tell you that they are now one of my favorite products of all time. Each paper stack pack includes 40 ea. 12x12 sheets of Designer Series Paper. They come in stacks for each color collection. I really love the "Brights" Collection. These are just the bomb! 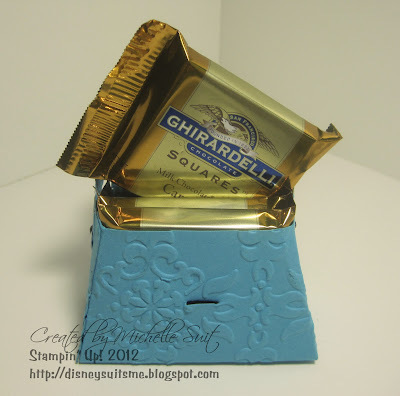 I think one thing that drew me to Stampin' Up! in the very beginning was that all of the products coordinate. Everything from ribbon to ink to card stock to DSP to accessories. I never have to wonder what will go with what. It's just so simple. The paper stacks are awesome because they coordinate with the other Designer Series Specialty Papers. They are double sided and so versatile. 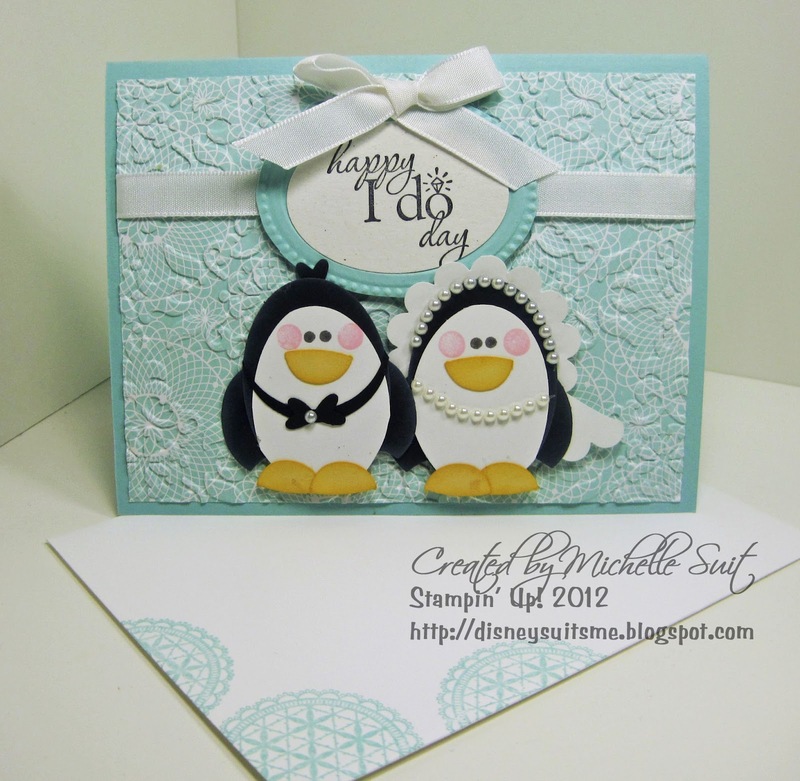 The printed DSP on this card and the matching envelope are from the Brights Collection Stack. Ok.... 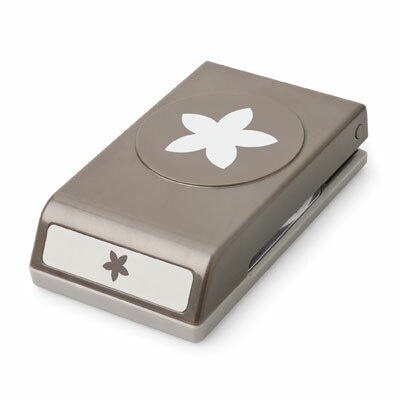 If you love the Triple Treat Stamp, make sure to go online and order it soon. 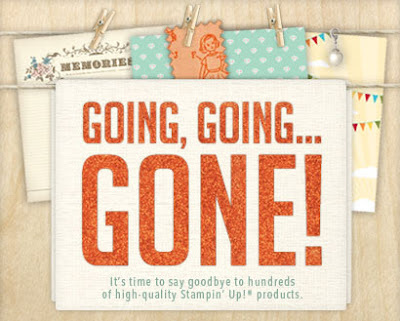 It will only be around until May 31st when all the retired stamps are gone for good. It's definitely one to keep in your collection and it's sure to make your projects a triple treat indeed. Hope you had an awesome day. Mine was definitely a "busy as a bee" one to say the least. That might take an entire post of it's own. for now though, I need to share something with you that is SO stinkin' c-u-t-e! 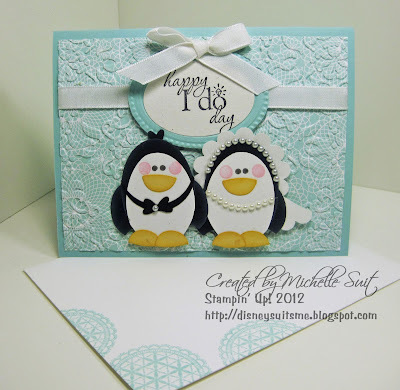 Each of the stampers got to choose the Designer Series Paper from the Summer Smooches Suite and then they picked coordinating card stock. The one on the left is made with Daffodil Delight and is embossed with the Polka dot embossing folder. 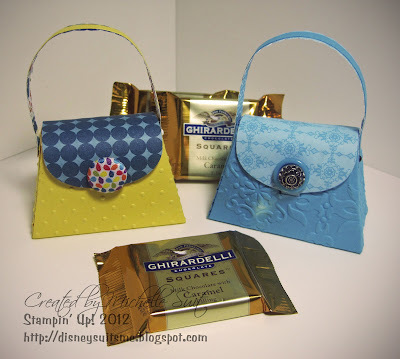 The one on the right is made from Pacific Point card stock and is embossed using the Vintage Wallpaper embossing folder. Aren't they cute? In the interest of (ahem) "research", I bought some Ghiradelli chocolates. Each purse holds 3 of them comfortably. There are so many other goodies they could hold and they'd be the perfect little gift for someone special. 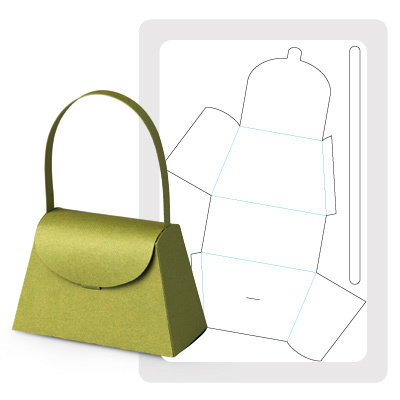 Create a perfect little purse in a snap with the Petite Purse Bigz L Die. Available now only for a limited time! I love how simple it is to put together. Just 2 tabs to glue together....attach the strap and VOILA! There's SO much to see....don't miss it. 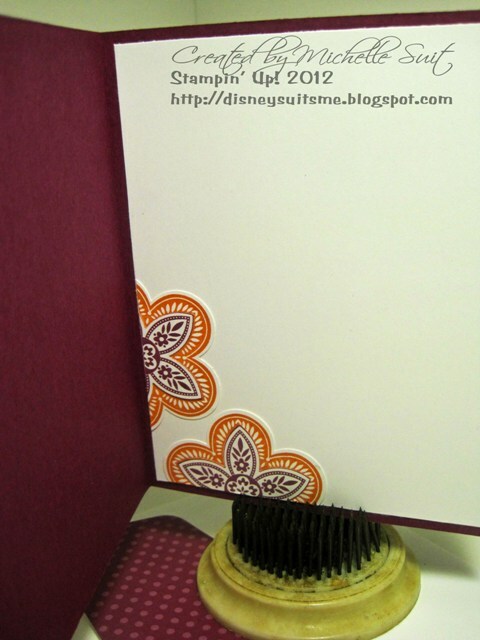 Today Stampin' Up! released the list of stamp sets that will retired at the end of May. There are a LOT of them this go 'round. 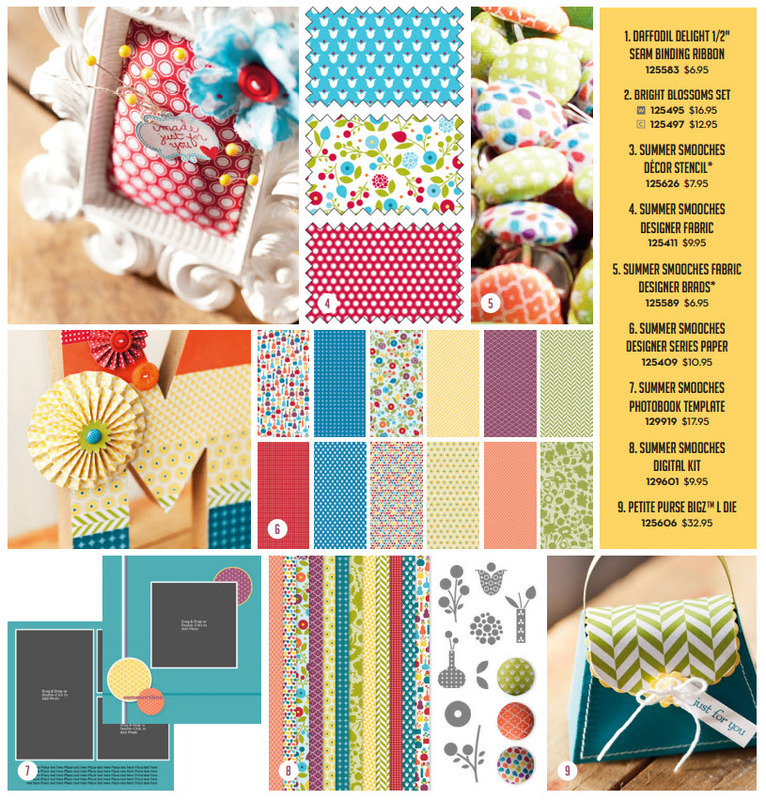 You may be wondering why.... Well, our catalog is going to be getting and incredible makeover and they needed to make room for TONS of new fun and fresh products. The NEW Catalog will be released on June 1st. Take a look at the Retired List and get out your highlighters! Don't miss out on all of the sets you've wanted and haven't gotten yet. Once they're gone....they're gone. Remember....you only have til May 31st to get them! Email me to reserve your spot! I am over the moon about this new collection. 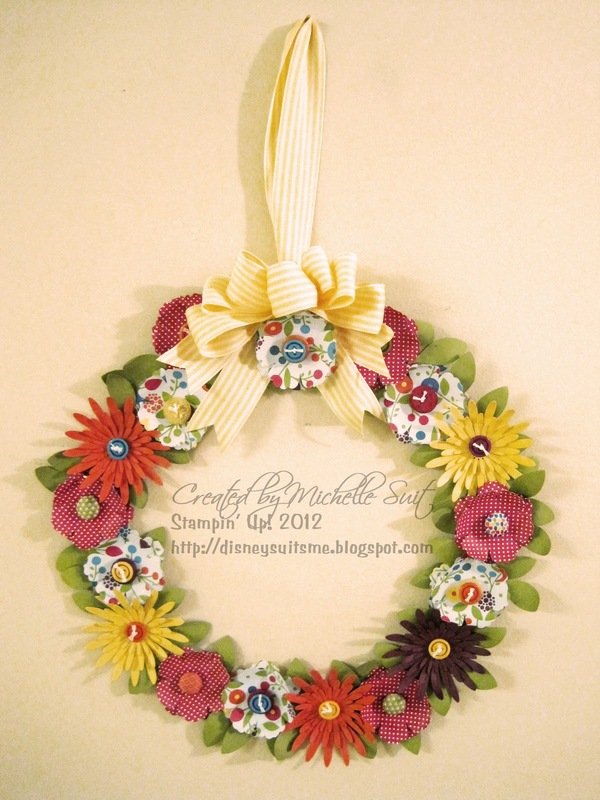 It is absolutely SO cute and just perfect for so many projects and occasions. I’m attaching the flyer to this email for you. It shows everything included in this awesome new suite of products. The suite includes: Summer Smooches Designer Series Paper, Fabric and matching covered brads (that are A-MAZING! 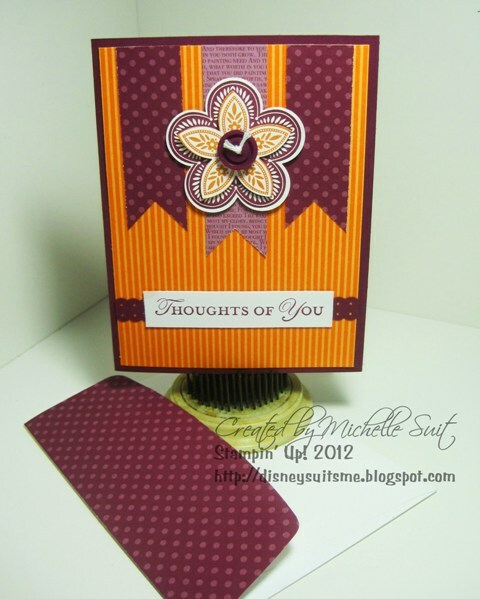 ), Daffodil Delight Seam Binding, a gorgeous new, coordinating stamp set and several digital products. Check them out. So....Do you want to play with some of these cute products? Well do I have the perfect stamp camp for you! Monday, April 16, 2012 - 7 to 9 p.m. Please email me no later than Saturday evening, April 14th to save your spot. 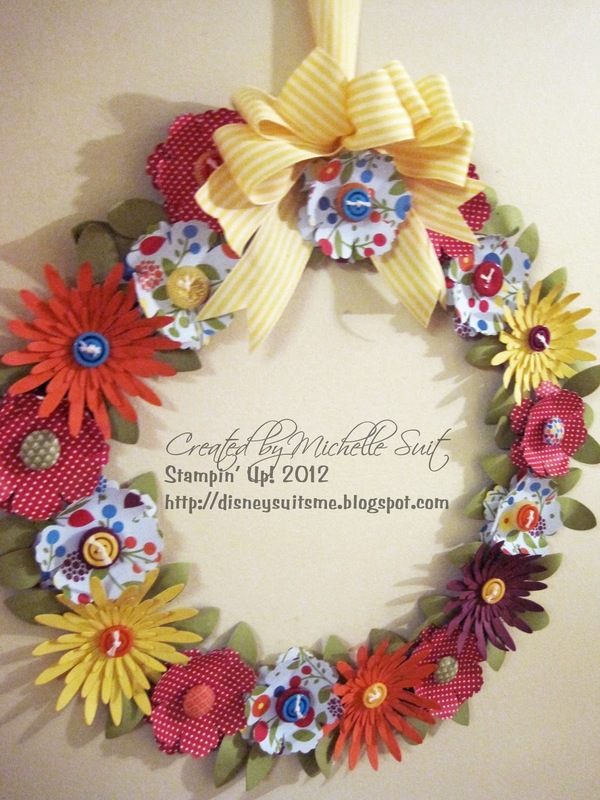 I can’t wait to share these fun new projects (and products) with you!